Fellow Muslims! Fear Allah, for it is the fear of Allaah that purifies deeds and devotes ranks. Be also aware, dear brethren, that Allaah’s greatest favor upon His slaves is the Faith and the Qur’aan. Faith is the light of heart and the most essential thing in man. And there is no good in any man who has no faith. The Qur’aan is the guidance, the light, the guide to all that is good andPreventer of all that is evil. It is the food of the soul and the purifier of the hearts. It contains injections on permitted and forbidden things and hold in between its covers details of this world and the next. Whoever holds fast unto the Qur’aan it guides him and whoever abandons it becomes accursed. Allaah says: “Verily, this Qur’aan guides to that which is most just and right and gives glad tidings to the believers (in the Oneness of Allaah and in the Messenger) who work deeds of righteousness, that they shall have a great reward.” (Al Israa’:9). He also says: “Whoever follows My guidance shall neither go astray nor fall into distress and misery. But whoever turns away from My Reminder (the Qur’aan) verily for him is a life of hardship and We shall raise him up blind on the Day of Resurrection.” (Taa Haa: 124). The Glorious Qur’aan is the everlasting miracle of our Prophet – Muhammad – peace be upon him – that addresses all human generations and shall continue to do so till the end of time. It convinces the human intellect with various proofs in order to subject it to the truth and make it surrender to Allaah willingly or turn away from the truth after it has recognized it out of arrogance. “No Prophet was sent by Allaah except that he was given what would make people believe in him, and what I was given is revelation and I hope to be the greatest of all the Prophets in followers.” (Al-Bukhaarie). This everlasting miracle that Allaah gave His Messenger, no human being or Jinn was able to produce a book like it while it was being revealed. Even if all Men and Jinn were to collaborate to produce something like it, they would not be able to do so. Allaah says, “Say: if the mankind and the Jinn were to gather to produce the like of this Qur’aan, they cannot produce the like thereof even if they helped one another.” (Al-Israa’: 88). Allaah even challenges those who have doubt about the Divinity of the Qur’aan when He says: “And if you are in doubt concerning that which We have sent down (i.e. the Qur’aan) to Our slave (Muhammad then produce a Soorah (chapter) of the like thereof and call your witnesses (supporters and helpers) besides Allaah, if you are truthful. But if you do it not , and you can never do it, then fear the Fire whose fuel is men and stones, prepared for the disbelievers.” (Al-Baqarah: 23-24). Allaah revealed the Qur’aan and made it a miracle so that making will know that it is the Word of Allaah, that Allaah is the only True Lord and that Muhammad is truly His Messenger. The Qur’aan is the greatest proof that tells us about the Attributes of our Lord and His Perfect Qualities. It also tells us about those imperfect qualities from which He should be deemed far above. He says, “Those are the verses of Allaah which We recite to you (O Muhammad) with truth. Then in which speech after Allaah and His verses will they believe?” (Al Jaathiyah: 6). He who does not believe in the glorious Qur’aan and its miracles, no supernatural happening or signs will benefit him. The inimitability of the Noble Qur’aan lies in its marvelous arrangement, judicious laws, its verses that tell about the signs and mysteries of creation; in the comprehensiveness of its teachings, the truthfulness of its information on what happened and in the loftiness of its goals and aims. The Qur’aan has also brought out the community of Islaam which is the best of peoples. Allaah says, “You (Muslims) are the best of peoples ever raised up for mankind; you enjoin all that is good and forbid all that is evil and you believe in Allaah. And had the people of the Scripture believed it would have been better for them.” (Aal ‘Imraan: 110). Therefore, the mankind in its long history has never had a nation that is more just and kinder than the nation of Islaam. Brothers in faith! You are direly in need of taking to the characters and qualities that the Qur’aan call to. You must abide by its injunctions, refrain from all that it forbids obey its clear orders and believe in the ambiguous ones. The Qur’aan does not give its fruits to any man except if his soul is ready to receive it unconditionally, his heart is opened for its light and humble himself before it, Allaah says, “Allaah has sent down the best Statement, a Book (this Qur’aan), its parts resembling each other (in goodness and truth) and off-repeated. The skins of those fear their Lord shivers from it (when they recite it or hear it). Then their skins and their hearts soften to the remembrance fo Allaah. That is the guidance of Allaah,. He guides herewith whom He will and whoever Allaah sends astray, for him there is no guide.” (Az Zumar: 23). 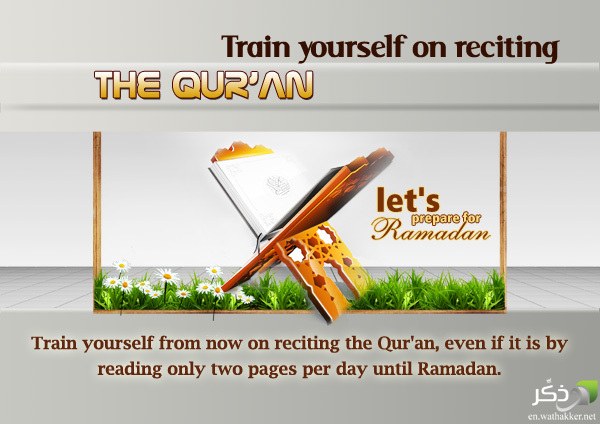 Reciting the Qur’aan in appropriate time assists in letting it have an impact on human soul and inverses one in guidance and light, Ramadaan is the best time to recite the Qur’aan for it is a food for the soul and because of the fact that the authority of a mind that tells man to do evil weakens during the month. The soul will then prevail and get strength by the Qur’aan and the man, as a result, will derive the highest possible benefit from it. Qur’aan is like a beneficial rain, the soul is like the earth and Ramadaan is like the good season for rainfall that enables the hearts to produce the pairs of blooming crops. The Messenger of Allaah said, “The similitude of the guidance and knowledge with which I was sent, is like a rain that falls on a land of which there was good part that accepted the water and produced there from many plants and grass. There is also a barren part that holds water and Allaah made it beneficial to people as they drank thereof, fed their animals and irrigate their farms. It also affected some parts of that are just lowland that could neither hold the water nor produce grass. The first two are the example of him that acquired the knowledge of the religion of Allaah, benefited from that which I am sent with and taught it to others. The third is the example of him who never paid attention to the Qur’aan and did not accept the guidance of Allaah with which I am sent.” (Bukhaarie & Muslim). Fellow Muslims! Seize the opportunity of the remaining days of Ramadaan to read the Glorious Qur’aan – with reflection and understanding of its meanings. Put its injunctions into practice. The Righteous predecessors used to preoccupy themselves in Ramadaan, with recitation of the Glorious Qur’aan and they always used to remember Allaah a lot. Dear brethren! Let it be known that any one who puts the injunctions of the Qur’aan in practice is among the people of the Qur’aan even if he has not memorized it. Also he who does not work by the injunctions of the Qur’aan is not among its people even if he memorizes it. Let those who memorize only part of the Qur’aan read it repeatedly. Brothers in Islaam! You must perform the prayer regularly and punctually for it is the pillar of Islaam and prevents one from immorality and sins. Whoever observes it preserves his own self and his religion and whoever neglects it is in loss and has wasted his religion. Prayer is the first act that man will be called to account for on the Day of Resurrection. If it is accepted, all other deeds will be accepted, and if it is rejected, all other deeds will be rejected and the one who abandons it in this life will be ordered in to Hell. Also, pay you Zakaah (Obligatory alms giving) before you are tormented with it after death. The Prophet said “Every treasure –owner who did not pay Zakaah on it will have his treasure presented to him in the form of a bald headed poisonous male snake with two poisonous glands in it”. We must Hurry..Time is too less…in worldly affairs we have deadlines here we cannot detect the deadlines also..Understanding of The Glorious Qur’aan and practicing it to the best of our ability is the key.May Allah Almighty help us in renewing our faith may we all be charged with the light and blessings of our Almighty and present ourselves the best among the people . Jazakallaahu Khayra for a very meaningful comment, brother. May Allah accept your du’aa and forgive your sins and reward you abundantly. Aameen.